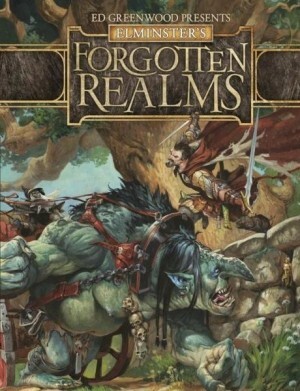 I love the Forgotten Realms. This mystical land first graced my imagination in my first year of college when a friend handed me a book by the title of Elminster: The Making of a Mage and they said I NEEDED to read it. Once I cracked that spine, I could not put the damn thing down. This eventually led to my deep infatuation with Drizzt, but that is a story for another day. Let’s just get this out there right now; this IS NOT a campaign book. There is nothing in here that is going to give DM’s a completely new campaign setting or players a new playable race or skills. So do not buy this book thinking it is going to contain some mystical goblin cave to explore with a new playable evil troll race, because those that do should prepare for utter disappointment. No, this book is something for all Realms fans that want to bring more day-to-day life into their campaign. I am talking what people eat, how they talk, what they believe, what diseases fill the world, and what children play with. Consider this a bit of research that takes players and dungeon masters closer to the world they game in. It gives gamers a new way to interact with their world while providing DM’s more fuel for a much more engrossing campaign. I found this book well organized with a table of contents being a great roadmap through the various chapters. I should also mention that there is new artwork scattered about the pages with little captions below them detailing what the image is. Of particular note are the “scanned” images of typed notes and flowcharts. These provide a glimpse into the deeper workings of the Realms and how they came into existence. What took me by surprise is the amount of detail in here. Ed could have just given us a list that said child’s toys and then listed said toys, but he dives into what the toys are made of, how they work, and why they are the most popular items among children. This detail is all over the book, from how a disease works and looks to the common wine adults consume. The premise could have been such a snooze, but man is it highly entertaining and enlightening. Anyone looking for stat blocks and spell listings, just turn away now. Those looking to read more of Ed Greenwood rambling on about wine and hygiene, or just want a way to further understand the world they play in, this is the book to own. I will read this book from cover to cover several times, while hoping my DM incorporates various elements into our existing campaign. I am a Ames, Iowa based photographer. I enjoy automotive, macro, still life, and street photography. To relax I wrestle dinosaurs.